a naim integrated, a mac mini, and which make of external hard drives does best in this setup? Any hard drive that will work on the Mac will be fine, the Naim amp won’t care. My Synology NAS uses 2 x 3TB WD Red drives. 5 years old, never missed a beat. I also have 2 x Seagate passport external drives as backups - each 3 yrs old, never missed a beat. I would happily buy either brand in the future. I use a Seagate and a La Cie.....the latter I think is owned by Seagate, both work fine. But not for the use the OP wants. Reds are for use within NAS enclosures which is what they're designed for. To answer the OP, you should buy from a known brand (WD, Seagate, Toshiba, etc, or one of their off-shoots, like La Cie), but beyond that chose on capacity, then price, colour, vertical/horizontal mounting or whatever is important to you. Most of the drives are pretty much the same performance wise in real-life usage, rather than benchmarks where small differences are made out to be more important than they are. I'd go for WD, but only because I find them quiter than the others, no technical reason. My reply was in response to previous posts regarding HDD reliability, both WD & Seagate were mentioned as unreliable. 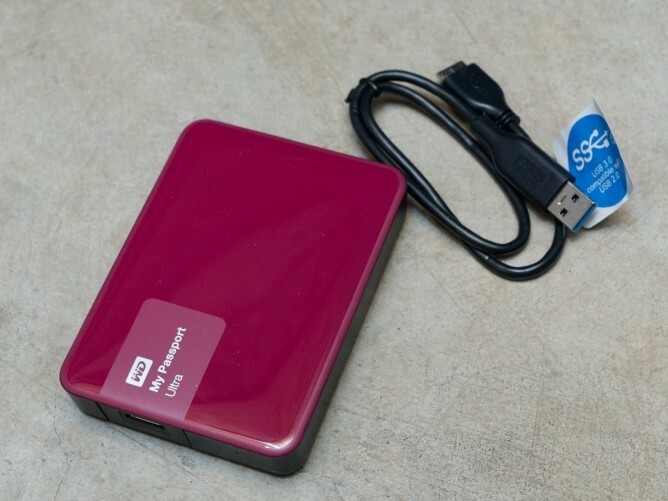 and i own already three WD My Passport Ultra's 3TB each; of colours red, blue & white. believe it or not, they all sound different from one another. Blue will be cool sounding, white a bit stark and red a tad aggressive. in fact, the red one sounds best and most balanced, the blue is ok, the white one sounds worst (hence my enquiry) and i only purchased it because the store ran out of black ones... i also want expansion of disk capacity, so now i need a 4TB external hdd or larger. Have you tried putting a Jitter Bug between the drive and MAC ? Does that affect things ? I'm sure it's not the colour that affects thes drives as you describe - more likely the contents of each isn't exactly the same or tolerances being what they are no two will be exactly the same. While on the "strange things..." topic, I've read that striping disks in a NAS produces much better SQ than mirroring them. No, I can't explain it either. My NAS is striped, but to give greater capacity/cost benefit at purchase time - no idea if SQ is better as I've not reformatted to compare (and yes, I back up after adding any new music to the NAS so the lack of a mirror, which seems the most popular way of doing 2 disk NAS, doesn't bother me. I'd never trust a mirror as a backup. Too much experience of it going wrong in the day job). Have you tried putting a Jitter Bug between the drive and MAC ? I've read that striping disks in a NAS produces much better SQ than mirroring them. and what 'striping' does mean? Can't say I've every noticed a difference, but I'd have thought jitter/RFI/whatever may have an effect. The Jitter Bug I have heard made a difference so at 40 quid may be worth trying - I suspect it would equal out the differences mentioned. As to why a RAID 1 and 0 configuration of the same drives in the same enclosure would make a difference - I'm not convinced, but as I said, there's at least one article out there about it being so (along with different SQ between brands of disk)* . I think it's a variation on the' ethernet cables sound different' discusson. If others hear a difference who am I to tell them they aren't/can't ? My understanding was that it's rubbish on the bus, i.e. both ways, to and from disc, that the jitterbug claims to reduce not just the USB output from PC, otherwise it would be pointless using one to improve replay from the disk as it would be filtering the wrong way (assuming it makes an audiable difference, rather than being just another way to give Audioquest money). If you have multiple disk in a NAS (or computer in general), there's different ways you can use / combine them. E.g. treat them as individual disks, copy/read data to/from 2 disks in parallel ("mirroring"; keeps your NAS going without interruption, if 1 disk breaks; does NOT count as a "backup", as it only protects again physical disk failure), or spread your data around several disks at the same time to utilize their combined read/write speed - that's called "striping", since the data is sliced into "stripes" and those are spread across the disks. While at the IT part: I'm positively sure, that the bits going out of the NAS are identical to those stored for any (music) file to the bits stored - i.e. the disks (type, model) and the way the data is spread across them does not matter for the data sent to your streamer/DAC. Thus, there should not be an effect on the SQ as derived from a DAC in another unit. (Except maybe for any electro-magnetic interference or effects on the shared power source; I personally find it hard to believe a human could detect those under normal operations conditions). If something would be very amiss (data corruption), you might here random noise (crackle, ...) but I cannot imagine, how a change in "musical/melodic qualities" could manifest itself. However, as another poster mentioned: if people perceive a difference, they are absolutely welcome to spend time and money on investigation and tweaks. i use external hard drives powered by the comp itself. just to clarify. Are your Hard Drives in any enclosure or simply connected to the computer’s motherboard by SATA cables? You can get more sophisticated external housings that hold multiple discs and allow mounting as “jbod” (each physical drive gets mounted as an independent volume; might be x:, y: drives in Windows for example) or RAID (flavours of which include mirroring and stripping as described by Philippe). Some of these boxes offer USB and eSATA connectivity; some are externally powered and some (lowered powered) are powered over the bus. Just to put the cat amongst the .......... my SSDs in my Qnap sound better than the WD Reds in my Synology. Though more expensive SSDs are the way to go..... silent, run cooler (my Qnap is fanless). But a thumbs up for WD Red Pro if you have to have a HD. Have you, by any remote chance, tried the SSDs in the Synology or the WD Reds in the Qnap??? I ask mainly because I remain skeptical about physical media differences contributing to audible differences, but remain open to the idea that different overall solutions, from different vendors, with different interfaces, firmware, network stacks and so on, might also have other (less obvious?) differences (noise floor, timing, etc.) that might lead to audible differences. I know it’s a long shot, but you might have given that experiment a go, so I thought I’d ask... For transparency, I admit I’ve never tried this, but maybe I’m easy to please as I’ve not been unhappy with (or really able to hear differences between) any of the several different UPNP solutions I’ve tried. Are your Hard Drives in any enclosure or simply connected to the computer’s motherboard by SATA cables?